Relatives of John Pat Cunningham say they are angry that the soldiers involved were never disciplined or even properly interviewed about the murder. The disabled farm worker was shot in a field near his home in Benburb in June 1974. Mr Cunningham was 27, but had a mental age of about eight. He was walking home when he was approached by a British Army patrol. Startled, he began to run away when two soldiers raised their guns and fired five shots. A report by the Historical Enquiries Team (HET) on the murder this week said it was impossible to determine who fired the fatal shot. At the time, the two soldiers were interviewed briefly by the RUC police but refused to answer questions. Crown Prosecutors did not bring criminal proceedings. The HET report said Mr Cunningham’s death was “an absolute tragedy that should not have happened”. It said that he had a fear of soldiers and their uniforms, that he was unarmed and that there was “no evidence that he posed a threat to the soldiers or anyone else”. Mr Cunningham’s family welcomed the apology from the British Ministry of Defence, but said more answers were needed. They urged PSNI police chief Matt Baggott to make the soldiers accountable as the HET report said should have been done at the time of the original investigation. “By not obtaining the soldier’s account of what happened more vigorously, the investigation was not as thorough or effective as it could have been,” the HET said. Interviewing the soldiers represented the “only realistic lines of enquiry”. Mr Cunnigham’s nephew Charlie Agnew said: “Even to this day the two soldiers have never been compelled to give an account of why they opened fire and shot an unarmed and defenceless man in the back as he ran away from them. Mr Agnew said his uncle’s death had “devastated our family”. “He was a completely innocent man who did not deserve to die,” he said. 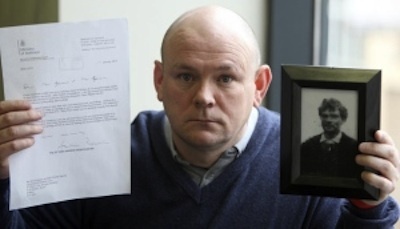 Solicitor Kevin Winters said he had written to Attorney General John Larkin QC asking for a fresh inquiry. He said he was also seeking a new compensation settlement after just 750 pounds was originally offered.